Real men don't eat quiche. Indeed. This was the title of an article in a girlie magazine of way back when. The idea was reiterated recently in a local beer ad here in South Africa that had it that real men don't drink pink drinks. The idea probably rides on the macho image of South Africans as serious meat eaters. I tend to agree, but certainly took this magazine article as a challenge. The same sort of challenge that our English language teacher posed to us in class on the subject of essay themes. He would set us a theme, then add that it stands us free to rather write an essay under the title “My Dog Spot” instead. He offered to then mark such essay accordingly. I often toyed with the idea of writing such essay in addition to the regular set theme, then hand it in, marked as my entry to his challenge. Sadly, I never did. It would have been a great opportunity to write something extraordinary and creative on such an inane subject. A chance to really think up something with a twist. On a recent upcountry road trip we chanced to stop for lunch in the delightful town of Senekal in the Free State province. It was a balmy day and we were on our way to the stopover at Colesberg, still some distance away. At the bottle store we made enquiries as to a quiet place for a light lunch and was directed to a local coffee shop where we had the most delicious quiche imaginable. The old magazine article immediately sprung to mind and the idea of a challenge was born. Busting some myths, no less. Real men don't eat quiche. Yea, right. So, having taken up the challenge, I did some searching on the internet and found, as usual, a myriad of recipes. There are plenty examples of quiche using various vegetables as well. Having taken bold the step of going outside of manly machismo, I decided to make a classic quiche, just because of the value of the challenge. Perhaps also because it is the festive season and holiday weather here in the Cape. And, after all, it is some form of culinary adventure. The recipe is adapted from several on the internet, with a view of having a classic rich version that is easy to make. Here is my humble attack on the myth of real men not eating quiche. Quiche Lorraine a la The Hungry Sailor. 2-3 dessert spoons water as required. We start with the crust. I made this one in an aluminium foil pie dish, as I do not possess a porcelain or stoneware version. Dice and chill the butter. Mix the flour and salt, then rub the butter into the flour. Add just enough water to make it the consistency of dry wall plaster or dry-ish plasticine. It should not be runny at all. Spray the pie dish with a suitable release agent or butter the dish. Line the pie dish with the dough, pressing it down and making sure it has an even thickness all around. Roll it out flat if you want to. Park this in the refrigerator while the oven heats up. The oven should be heated to 200ºC/400ºF. Bake the cold crust for ten minutes, then remove from the oven. Allow the crust to cool. Remember that it is now very brittle, so don't bump it. The filling is prepared as follows: Fry the bacon lightly until almost done, then drain on a piece of paper towel. Grate the onion and drain it on some paper towel as well. You don't want too much of the onion water in your filling. If you have reservations of grating the onion, just chop it finely, like I did. The onions go into the filling raw, so you don't want large pieces. Mix the cottage cheese and cream thoroughly. Add in the eggs. You may beat the cream beforehand till it just goes slightly stiff. Now mix in the onion and parsley and add some nutmeg to taste. Building the final product is easy. Spread the bacon in the bottom of the crust, then pour in the cream and cheese mix. Sprinkle some grated cheddar cheese on top, along with a whiff of smoked paprika. Carefully put this assembly into the oven at 180ºC/350ºF. If you think you may have a mishap and break the crust or spill the filling, assemble the quiche on the oven rack itself. It may make your life easier. Use an oven pan under the dish, as it may spill as it cooks. Now bake this for about 20-25 minutes. Allow the quiche to cool down properly before attempting to cut it. It is good when warm, but it will be quite brittle and soft when you take it out of the oven. This quiche was easy to make, my first one. It is quite tasty and not nearly as rich as one would imagine. Goes well with a fresh garden salad. This dish can be eaten cold as well. Having a small family is sometimes a hindrance to a food blogger. With just the missus and myself, things get tricky when thinking up new ways to prepare food, given the small quantity required. The normal way around the problem is to invite friends or family over for dinner. However, that avenue has its own dangers, not the least of which is the cost of having a weekly “Come dine with me” episode playing off in your humble abode. After some thinking and taking into account that I am under orders not to make another stewed dish, I came up with the idea of a slow roast. This one conjures up visions of a piglet, complete with apple in the mouth and so on. My humble budget does not stretch that far and I have this suspicion that most people do not have an oven that big anyway. So, after some more reasoning, the idea formed that one can make a roast without having to buy a whole leg or shoulder cut. Chops will do if you stack them in a solid pile. One is then able to purchase only enough for the guests in the house, as you can buy chops in individual portions. Having said this, one should realise that the stack of meat should be sufficiently bulky to resemble a whole shoulder, for example. In my case I opted for the cheapest lamb or mutton chops I could lay my hands on. Shoulder and leg chops will do just fine. The reasoning is that the slow roasting process will take care of any toughness anyway. Having decided on the process and the cuts, the world is open for deciding on the style and flavours. If you have a tagine at hand, that will work brilliantly, the lid keeping the juices inside and allowing for a slow steaming process. I do not own such equipment, so I used a ceramic baking dish of suitable size. The dish has no lid, so I just covered it with some aluminium foil. A cast iron pot or saucepan will also do, as these come with a lid. That takes care of your cooking utensils. As for flavours, I decided on a Persian style spicing. I like the spicy flavours, but again I am under orders to prepare some less spicy dishes. This one has a perfumed spicing, very flavourful and quite rich. It goes well with the fatty meat cuts. The recipe is adapted from the book Persiana by Sabrina Ghayour. A welcome birthday present and addition to my library from my son and his fiance. I was not able to find all the spices listed in the recipe, so I substituted some after some discussion with my local spice merchant. The lime powder was substituted with dried citrus peel. This dried citrus peel is of my own making, being mandarin orange and satsuma peel that I dried in the oven, then blitzed in the blender. Edible dried rose petals are also not really a part of the local cuisine, so I substituted rose water, which most larger grocers sell here in South Africa. Sumac was something new to me, not having heard of it before. It turns out to be ground-up berries of the Anacardiaceae family of plants in the Rhus genus. Check it out on Wikipedia and on the Spice House web site. This dish was served with mashed potatoes and steamed vegetables. I kept the portions medium to small, as the meat came out very rich. You may want to make this dish when the neighbours are all at home; it will count as psychological torture! The flavours emanating from the kitchen are really something special, as is the taste. Mix the spices thoroughly, then add some oil to make it into a paste. Add the rose water and mix well. The spices will ensure that the rose water/oil mix does not separate. Cut the sinews and fat layers of the chops to stop them from curling up during the cooking process. Coat each piece of meat thoroughly and stack them tightly in the baking dish. Add some salt flakes between layers. Cover the dish with aluminium foil or put the lid on. Allow this to marinate for and hour or so. In this case you have lots of thin layers, so it is possible to overdo the marinating time. Set the oven to 160°C/320°F and pop the roast in the oven for three to four hours. By this time the meat should be almost falling off the bones. No need to use a knife here, you flake the meat using two forks. This I served with mashed potatoes and mixed vegetables steamed over the boiling potatoes. A simple dish with lots of flavour and very little work in the kitchen. It gave me time to enjoy a glass or two of red wine with the missus. Winter arrived properly here in the Cape yesterday, along with the associated rain and cold. Today we have had some thunder and lightning already, with heavy clouds over the Helderberg. Time for a real winter stew. For a while now I have been thinking of traditional African stews. A search on the internet revealed very few local recipes. Those that are listed vary from having very simple ingredients to some exotic spicy versions. Mostly the dishes are from outside of Africa. So I decided to have yet another version. A stew with an East African slant, if you will. This means that there needs to be a hint of the Middle East in there, with some exotic flavours, but not too spicy. Having reasoned thus far, the ingredients started to settle in my mind. Lots of cumin, smoked paprika, mixed Madagascan pepper, some garlic, a hint of cinnamon, then some sage and coriander leaves at the end. Coarse sea salt. A dollop of soy sauce. Done. To give this dish an African flavour, I added red kidney beans as well. My reasoning was that the dish will be served with samp, the broken cooked maize kernels that are so traditional in Africa. Mixed samp and beans is quite popular too, but I decided against this as there was beans in the main dish anyway. Samp is soaked in salt water for two to three hours prior to cooking. The kernels will soak up some water and wash off some starch. This is discarded and fresh water added for the cooking, which also takes one and a half to two hours. At the end the kernels are nicely swollen and quite chewy. To this I added a dollop of fresh cream and a knob of real butter. This makes for a rich creamy flavour to soak up all the juices from the oxtail. Oxtail tend to be very tough and has lots of fat. You may not want all the fat in your dish, but do not despair. There is no need to cut the fat off, the process will take care of this. The beauty of oxtail is that one cooks the meat to a very gelatinous consistency, giving the dish an almost creamy texture. In this case I patted the meat quite dry, then fried the pieces in butter and cooking oil until it turned a nice toast colour of brown. The meat is done in batches to not have juices soaking up the heat and causing a cooking, rather than frying process. The meat is then set aside to rest while you prepare the sauce. Discard the contents of the skillet, that is where most of the unwanted fat will be. This leaves the meat less fatty and nicely caramelised on the outside. There is another angle to this dish: I made it the day before. This allowed the flavours to develop overnight. When cooking with spices, the flavours tend to be on the sharp side as a result of the frying which lets the oils out of the spices. Allowing the dish to rest will get rid of the very sharp essential oils and leave the basic flavours to marry. The meat also gains some texture, as it relaxes and is therefore a bit more tender. On the cooking process there is much argument and debate. Some people use a pressure cooker, others like me don't. Some people will have the dish on relatively high heat, while others will use only the barest minimum. I follow the slow route. I believe that cooking any meat fast will cause some chemical changes and the meat will turn out like rubber if you are not careful. Also, I am told, the meat needs to be at room temperature before you start cooking or frying, otherwise it may go tough anyway. Oxtail specifically is quite tough and I have had some very rubbery meat served to me on the odd occasion. Prepare your food with care and your efforts will be rewarded by the flavours. Heat up a knob of butter and a dollop of oil in a skillet. Fry the pieces of oxtail until they are nice and brown outside. Fry them in batches if needs be. They must be brown, not grey. Set them aside to rest. Discard the juices from the skillet. The sauce is started by heating up some butter and oil in your saucepan. Fry the onions, green pepper, celery and carrot until the onion is translucent. Add the garlic, chilli and the coriander seeds and fry for another twenty seconds. Now add all the tomato and the rest of the dry spices. Add the dollop of soy sauce and the beef stock. Bring this lot to the boil, then add the meat back in. Ensure that the meat is covered in the sauce. Add some water if necessary. Turn the heat down and allow the dish to simmer for three hours. Then turn the heat off and allow the dish to rest overnight. On day two, bring the dish to the boil and add the carrot sticks,some chopped coriander leaves and the chopped sage leaves. Allow to simmer for another one and a half to two hours, then add the beans. Wash the beans of its juice before adding it to the dish, this will probably cause the dish to burn. You don't want that at this stage of the proceedings. 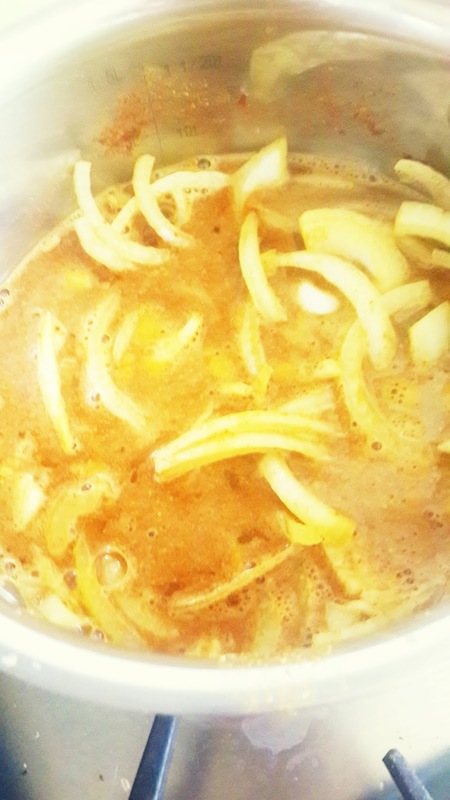 The sauce may be allowed to reduce some at this stage, making for a thicker sauce. Check for the saltiness after the beans have been added. The meat should be falling off the bones by this time. Bring to the boil, then turn the flame off and allow the dish to rest again for fifteen minutes. Soak the samp for two hours in salty water. Drain the starchy water and replace with fresh water. Add some salt, then bring to the boil and boil slowly for two hours or until the maize kernels are nicely puffed and chewy. Drain the excess water and add a good helping of butter and two to three dessert-spoons of cream. Mix this thoroughly. The result should be a very rich smelling and creamy tasting chewy maize dish. Now dish up. This dish goes well with a full bodied red wine and good company. I recently seemed to have lost my zeal for cooking. Perhaps I lost my muse, as authors and artists would have it. Or perhaps the two major surgical procedures and the large amounts of anaesthetic in my body had something to do with this loss of muse. Or it could have been the scare of finding a large cancerous tumour on my kidney and having it removed. Whatever the case, after a two month sabbatical from cooking and from sailing, I am back. The recent spell of cold weather in the Cape triggered a primordial urge for a hearty stew. It is as if the cold weather creeps into your bones and your body tells you this cold will only be chased away by a hearty stewed dish. After a short internet search, I had the idea. Osso buco. That very Italian dish that warms the cockles of your heart with the meat almost melting in your mouth. The internet search was short, simply because I was very hungry. So I searched for stewed beef dishes. The standard recipe calls for veal. I summarily dismissed the idea and went and bought beef shin. Here in South Africa beef shin is relatively cheap. The cut need not be very tender, as the stewing process will see to that. The process is what makes the dish. Spices are very simple. On one of the myriad web sites quoting a recipe, the author remarked that there appears to be an ongoing, raging debate on whether to use tomato or not. Then some recipes call for fennel, some not. Some require sage, others not. And so on. Being of a somewhat eclectic bent, I decided that my recipe will be a fusion version. There will always be some chilli in my stewed dishes and mostly not any wine. I use soy sauce instead. The soy sauce has a slightly richer texture and a fuller flavour. Dial Rock, Saldanha bay. It is good to be out on the water again. Osso buco is basically beef shin or veal stewed in a bed of vegetables. Notably celery and carrot. These hard vegetables do not cook away, so you have some chewiness at the end of the cooking. Again, allow the dish to rest for at least half an hour before dishing up. This will allow the initial sharpness of the ingredients to calm down and allow the more subtle flavours to come out. As for cooking, most recipes will have you simmer this dish in the oven for a long time at reasonably low temperature. I chose to cook the dish in a cast iron casserole on the burner. Again at low temperature for a long time. I used the same dish for the initial frying of the meat and the subsequent cooking. This will have the caramelised bits of the frying as part of your dish. The dish then makes its own stock, thereby enhancing the flavours. The Milanese version of the dish serves it up on a bed of saffron risotto. I chose stock standard mashed potatoes. There is something earthy in mashed potatoes don't you think? This mash was made with milk and real butter, making it rich and creamy. Osso buco needs a gremolata as well. I have never made this, so all was a bit new. Gremolata is quite simple. Mashed raw garlic mixed with finely chopped parsley. A no-brainer. However, this one has some trick to it to make the flavours come out. I use a little table salt with the chopped garlic when mashing it. The salt prevents the garlic from splattering all over the place. The salt also draws some juices out of the garlic. Add the finely chopped parsley and the salt keeps on doing its magic. For this recipe I added some very finely chopped up citrus peel to the gremolata. Make the gremolata while the meat is cooking. This will allow the gremolata's flavour to develop as well. The gremolata is served as a garnish on top of the plated food. I put half of the quantity into the casserole when I turned off the flame. 3 celery sticks chopped. You need about ¾ cup of chopped celery. ½ large carrot finely chopped. Again about ¾ cup of chopped carrot will do. 1 50 ml sachet of tomato paste. 1 cup of chicken or vegetable stock. Zest of half a lemon. I used some dried citrus skin, finely chopped. Pat the meat as dry as you possibly can, then dust the meat with the flour. Make sure than all the surfaces are covered. Get the casserole up to heat and add the olive oil. The casserole should be of such a size that the meat can lie flat inside without being bundled up. Now fry the meat both sides until it is nice and brown. Take c are not to burn the meat. The flour may burn earlier than the meat, so your close attention is required. Remove the meat from the pot, then add the butter. Turn the heat down if required. The butter must not burn. Allow the butter to melt, then add the chopped onions, celery and carrots. Fry these gently until the onions go translucent. Then add the garlic and chilli. Fry these for fifteen seconds or so. Now add the chopped tomatoes, the can of tomatoes and the dollop of soy sauce. Allow this lot to reduce to about half the volume, then add the stock. Mix through thoroughly. Now place the pieces of meat on top, making sure that the meat is covered in fluid. The parts that stick out will not cook properly. Add the juices that oozed out of the meat while resting. At this stage I added some small onions whole, just for garnish. Add the tomato paste now. Add the sage and the fennel, tearing them by hand. Sprinkle some oregano over the lot. Turn the heat down to minimum on your smallest burner and put the lid on. Check every half hour for sufficient fluid in the pot and ladle some of the juices on top of the meat. Now make the gremolata. Chop up to buttons of garlic, using some table salt to keep the bits together during mashing. Add the chopped parsley and the lemon zest. Mix this thoroughly. The quantity should be around three table spoons. The test for readiness is the tenderness of the meat. The meat should be marrow soft. This will take about two to three hours. Turn off the flame and sprinkle half of the gremolata on top. Close the lid and make the potato mash. Remember to add some real butter to the mash. Then dish up. Sprinkle some gremolata on each serving as a garnish. This one goes very well with a full bodied red wine and low lights. Like candles. All images taken with LG G3 smart phone and processed with Photoshop Express. It is that time of year again. Easter. For some reason Easter is celebrated in South Africa almost like Thanksgiving in The United States; Lots of family gatherings and lots of food. Perhaps it has much to do with being the end of the harvest season. Us city- and seaward oriented folks tend to get somewhat dislodged from Mother Earth and the seasons. But the religious festivals help to keep us in line with the seasons. For one, I know this festival is very close to the first equinox of the year which falls on 21-22 March. That is when the sun crosses the equator on its way to the northern hemisphere for their summer. It is also the first star gate of the year for some religions. But here it is Easter. Time for wonderful celebrations and always accompanied with good food and wine. The Cape is no exception and Mother Nature played along very nicely this year and provided lots of good fishing recently. This played magnificently into the tradition to have pickled fish and bread for a picnic lunch in the balmy autumn weather here in the Cape Town area. I am not a fisherman, so I went to the local fish market by the jetty and bought a fish. 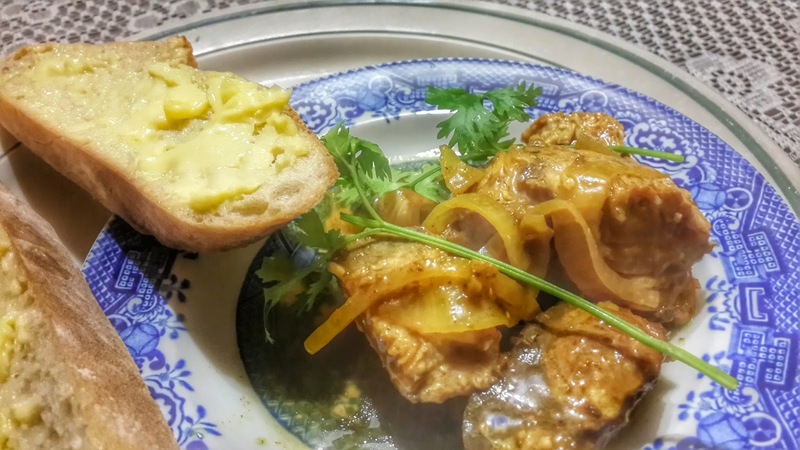 Pickled fish appears to be like South African potjiekos, a very personal dish with jealously guarded recipes. Luckily for us, not all recipes are so closely guarded and we have the famous Cass Abrahams, who published her recipe for pickled fish. 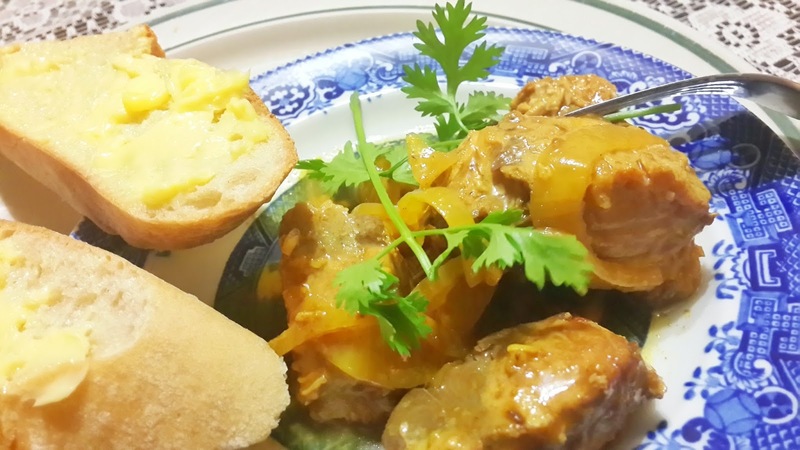 This one is special also because it is one of the very traditional Cape Malay dishes, steeped in history. For me, this was the perfect opportunity to test the Cape Malay style spiciness. The spice mix is simple, the preparation easy and the waiting time forever. I did not even bother doing an internet search, as I had a proper reference handy right on my bookshelf: Cass Abrahams cooks Cape Malay, by Cass Abrahams. The book is available from Amazon books. This recipe is adapted from this book. This dish is normally made using cheap fish. 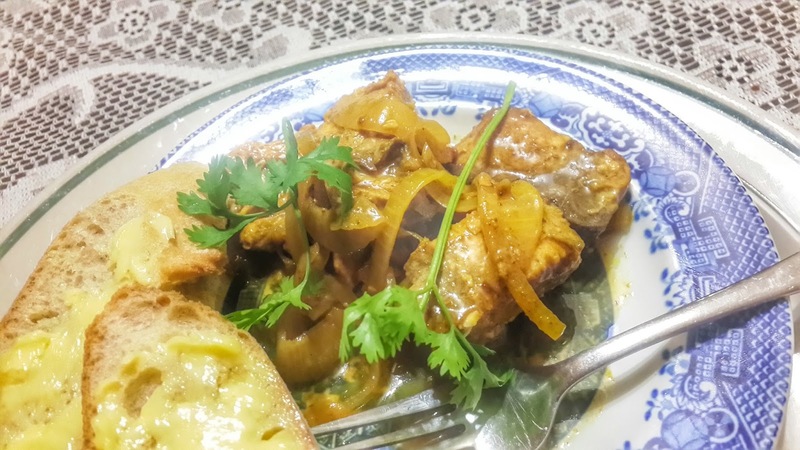 The book calls for snoek, which in other parts of the world is called queen mackerel. However, any fish will do. Especially game fish as they have firmer flesh. The recipe may be made by frying the salted fish in butter or in a light batter. It does not make a difference. I opted for the plain frying in light oil as per the recipe. The dish also calls for vinegar, for which I used apple cider vinegar. This gave a very fruity taste to the dish and I had to add a little regular vinegar to get the acidity levels up. The sugar is added to your own taste, so take care. It is easy to have too much sugar. You can always add some later when the dish has cured for a day or two. The solid ingredients need to be submerged in the pickle. If not, add a little vinegar and turn the whole lot around. This will get the bottom pieces to the top and allow the top ones some better soaking and curing. 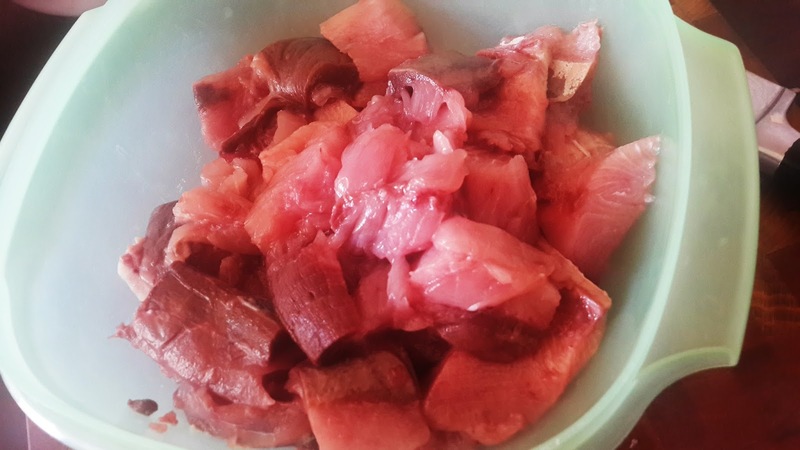 Be careful not to break the pieces of fish, else you end up with flaked fish in brine. Very important: The skin needs to be taken off game fish. The brine or pickle will not penetrate the skin and thus leave your fish not cured and tasting bland. I tend to always skin the fish. You may do this by soaking the cuts in boiling water for a minute or so. The skin will then come off easily. The size of the cuts does not matter. However, I like to have all the cuts with at least one dimension under my control. This means I cut all the pieces to the same thickness, which, in my case, is about 20mm or ¾ inch. This will ensure a similar curing time for all the cuts. Over-curing does not matter, but under-curing does. And make sure the onions are properly cooked, otherwise you end up with very crunchy bits! The onions may be fried in butter before adding to the pickle, if one so prefers. Salt the fish and fry until done. I did mine in batches. Keep these to the side and keep the frying oil. Add the fluids and the dry ingredients, except the sugar, to a saucepan and set to boil. Turn the heat down and simmer for a few minutes until the onions are translucent but still firm. Add sugar to taste. Pour the hot sauce over the fish and ensure that every piece is properly coated with the pickle. Allow to cool and set into the refrigerator for three to four days. This will allow the flavours to develop and help the fish and onions to cure. Turn the lot every day to get the pickle soaking in properly. This dish goes well with an artisan loaf of bread, real butter and an off-dry white wine. Bread And Butter Pudding? Not Again! Yes, again. One of the simplest puddings in the world. Not Banting style, for sure. But this is a dessert after all. The idea for this dessert came up recently with small cold fronts reminding us that the summer is over and that it is time for some hearty winter fare again. This one started, as usual, with an internet search. I was certainly not going the traditional way of using slices of bread, buttered and some apricot jam spread over, all squashed in a suitable dish, egg batter added and baked. The internet search revealed a myriad of recipes. After surfing this mass of information for about five minutes I was salivating all over the keyboard! Never did I think that this humble dessert would attract so much attention. The ingredients vary from simple to intricate and exotic. Fillings vary from jam through dried fruit and frozen fruit to fresh fruit and nuts. There are some versions that resemble more of a main dish than a dessert, using some meaty filling. Mine was going to be a dessert, simply made, but with some deviation from the very staid traditions. Some versions use baking powder to get some fluffiness into the dish. I opted for going the traditional way to keep it simple and away from all kinds of chemicals. The bread itself is sufficiently refined. Speaking of the bread, most recipes call for stale bread. One blogger stated firmly that there is no such thing as stale bread, just another opportunity to creatively use bread with character. I agree with him. And did you know that you cannot make a decent hamburger using fresh bread? The crumb is simply too soft. You have to let the bread mature for at least a day before it will be firm enough to make a hamburger. So here I am in this creative mood, salivating already just from the thought of a deliciously warm and hearty dessert. My design instincts told me that the pudding needs to be as light as possible. I was slightly snookered here, as I did not have three day old bread and had to buy a fresh loaf. I scoured the fruit shelves of my local vendors, but no obvious fruit came into view. In the end I opted for some blueberries. These may be found year round on supermarket shelves nowadays. I also had dried fruit in the form of fruit cake mix. My packet of cake mix is quite old and the fruit had crystallized. This would be useful as well. And then I topped the list of ingredients off with real vanilla from pods I bought in Madagascar while on my last ocean voyage. The saucy part of the dish needs sufficient egg to bind the lot. Some recipes use about one egg for every two slices of bread. This seems a bit over the top and I settled for three eggs for the eight slices of bread I used. For the milk I used a mix of fresh cream and milk, mixing this into the stirred eggs and adding in the vanilla seeds from one pod. The blueberries were mashed in a mortar and pestle. I use one from le Creuset as it has the right size for my needs. Save some of the blueberries for garnish. This recipe is sufficient for about six servings. I used a small stoneware dish, also from le Creuset, for the baking. The dish comfortably holds eight slices of bread. Bear in mind that the dish does rise a bit during baking, so use your common sense in the choice of dish for the baking. Build the pudding in layers. Add garnish. Spread the butter liberally on each slice of bread. Arrange the slices in the dish, butter side down. Add a dash or two of blueberry mush on each layer of bread, along with some of the dried fruit. The last layer of bread may be arranged in some artistic way to enhance the appearance of your dessert before serving. Mix 100 ml of the fresh cream with the milk. Add in the seed from one vanilla pod or use a teaspoon of vanilla essence. Pour this lot over the bread. Do it slowly to allow the bread to soak up the fluid. Now pop this into the oven at 175°C/350°F for twenty minutes. Then turn the oven up to 200°C/400°F for another ten minutes. This will bake the top of the dessert to a nice brown caramel state. I then switched off the oven, leaving the dish inside to sweat a little before I removed it to cool down. Remember. The dish may very well be soggy after the baking. You need to allow the boiling juices inside to finish boiling and for the steam to evaporate. The dish will then solidify and the consistency would be that of a juicy cake. Serve this up with a dash of the remaining cream and enjoy. This one came out much better that I expected, with the blueberry juices nicely dispersed by the cooking. And remember, above all, use real butter. Sometimes I wonder just how language affect our normal thinking and the way we go about our business. The last week is a case in point. I already know about negative self talk and language. The stuff that the little voice in the back of your head tells you to scare you. You go surfing, for example, and when you see the size of the waves the little voice goes: “You're gonna get dumped.” And, of course, you do. It is because one tends to listen to this little voice, instead of ignoring it. From what I read, this little voice is actually your ego. Your inner self is strong enough to ignore this voice. Train yourself not to react to every input that you get from this part of your environment. Just like you train yourself not to listen to your small child misbehaving in public. When you get to this same idea applied to a group, things get more interesting. You are now faced with a group-wide thinking pattern and group behaviour. Add in a sailing vessel of suitable size and you can have lots of fun. Which is what happened the last week. The boat was in Langebaan area about sixty odd nautical miles from Cape Town and had to be brought back to base. Not a big problem, I have done the trip several times. However, this time I had people on board that literally got on a sail boat the day before. This was not my making, but dictated by a suitable weather window. You wait for a north-westerly breeze to have a down-wind or broad reach sail back to home. I made a very shortened lecture on docking the boat and reefing the sail, a long lecture on basic safety aboard, smoking practice and so on, then we set off. I taught these students basic knots on the way, names of the parts of the boat and as well as the names of the various lines. All a bit backwards, as I normally do these things on the first day and a half, before we go sailing. This helps with getting the new knowledge sinking in. We had a wonderful sail down the coast in bright sunny weather, arriving in Cape Town an hour or two after dark. Quite an experience for these young people. Did I mention the seasickness? Then, on the next day, the fun started. Not having gone through the mill of getting the names and uses of the various lines under the belt properly, my intrepid group of students now had to remember the names of the lines very fast. I found a corner of Table bay with a breeze gusting to twenty knots where we could play around learning to sail. Needless to say, I had a few glorious laughs watching the students' eyes grow wide in fear of the boat capsizing. We dipped a rail several times and had the mast just off the water once or twice. I had to step in several times to undo cleated lines. This dumps the wind out of the sails and gets back control of the boat. Of course, with the mast almost down to the water, things start to fall out of shelves and into the bilge water slopping about. It was only afterwards, when I did a rehash of each manoeuvre, that I realised just how large effect language has on our daily drudgery. Each time I asked the student in question what his or her impression was about what had gone wrong. And as sure as God made little green apples, I would get an answer in a sentence that does not contain any verb. Very disconcerting indeed. The person is not able to communicate to the outside world in a form of language that is understandable to another person. After some reflection on this, I had the idea that it could be partly the influence of the electronic media available to people. Almost all of these young people use a mobile phone to communicate. And they use an abbreviated language. Probably without proper grammar and without verbs. I then changed my style of lecturing to teach language skills rather than sailing. I taught them that the words “ease,” “dump,” and “release” are verbs, and that those words, used in conjunction with the words “main sheet” and “jib sheet,” which are nouns, not verbs, have certain semantics associated with such use. And that these terms, used in normal communication aboard, make life a lot easier on a sail boat. Arranging the course experiences around language of course has its own pitfalls. Everyone had to make changes to their way of talking, which meant changing thinking patterns as well. The students quickly cottoned on to what was happening and by the end of the course they were smiling again and could tack the boat without getting themselves knotted in the vagaries of the English language. Perhaps their experiences on the boat helped them to made the change in their consciousness to a place where they can now communicate on a more level plane than before. And here I was under the impression that a sailing vessel is very old technology, almost fading into the mists of time, to be fondly remembered as some sort of ancient transport. The last week saw me yet again playing the sailing instructor to a boat load of young people. Young, healthy people with appetites to match. Put in some physical sailing exercises, anchoring off Grainger Bay for a light lunch, then pulling up the anchor by hand before some more sailing. Add a dose of the wonderful Cape Town weather at this time of year, and you have five ravenous mouths to feed. Six if you include your favourite sailing instructor. Not that that is a problem, of course. Part of the course is to do the provisioning planning. This effort naturally includes finding out dietary constraints and then matching the provisions to suit. In this case we had a crew member not eating red meat. Pork and chicken, yes. But no red meat. Matching this requirement with our standard list of single pot meals could pose a problem. Our food stipend for the week does not amount to much and one does like to keep the food within that budget. Part of learning to make do in a minimalist way. So boerewors and mash, spaghetti Bolognese and chilli con carne were out of the question. After some deliberation, I remembered that the French has a dish they call cassoulet, made with beans and pork. A stewed dish, eminently suited for preparing on board. Of course, no proper sailor would go without some spice, so here was some more room for creativity. The North Africans are famous for their wonderfully flavoured stewed dishes. That gave me the idea of a fusion dish: French-Moroccan style chilli beans and pork. Something away from your standard chilli con carne using beef mince. For this dish we added some thinly sliced potatoes as starch, thereby making it a one pot dish. The ingredients are kept simple, as we have but a small two-burner gas stove on board and no refrigeration to speak of. A cooler box with ice, I'll have you know. Work space for preparing food is also at a premium. In addition, I have stopped using cooking oil on board, using butter instead. Partly due to the fire hazard of hot oil on a bouncing and rocking stove, and partly because the butter imparts better flavour. I have also found that people eat smaller portions when I use butter in the cooking. Banting again, no less. You may omit the potatoes in favour of couscous. We did not have any, but it will work well with this dish. Here the flavours lie in the process as much as in the ingredients. Just mixing it all in and cooking it will not bring out the flavour and you will have a bland dish that burns your tongue. And thus French-Moroccan style spicy pork stew was born. This quantity will feed six hungry sailors. 750g pork leg chops, cubed to 15mm/½ inch size and trimmed of fat. 2 medium potatoes, sliced to the same thickness as the pork. 2 dessert spoons butter for frying. Heat up the pot or pan that you will be using. Add a little butter. Fry the pork in small batches until they are brown. Set the fried pork aside to rest. Using the same pot, which will now contain a nice layer of caramelised pork, add some more butter and fry the onions and green pepper until brown. They will pick up the caramelised bits of pork. Add the garlic and chillies and fry them for thirty seconds. Add the dry spices and fry these for fifteen seconds, then add the tomatoes, the potatoes and the pork. Reduce the heat when the the pot starts to boil and simmer until the potatoes are done. Check for sufficient saltiness, the potatoes may make the dish somewhat fresh. Only then add the beans. Drain the fluid from the kidney- and butter beans. The baked beans go in complete with the tomato sauce. Mix thoroughly. The sauce will thicken substantially towards the end, so do make sure that nothing sticks to the bottom and burns. Allow the dish to cook through, then take the heat away and allow the dish to rest. This may not be easy, as by now the whole boat or kitchen will be pervaded by a delicious aroma. Many of us dream about a seawards life, independent of the land and making your own decisions. Programming your own life in accordance with your dreams, bowing only to the wind and the waves. An idyllic life, no less. I did exactly that. I changed my lifestyle from being a suburban dweller, commuting daily to and from a bureaucratic institution, to the life of a sailor. Granted, I do not own a boat. And I operate from a fixed base. I introduce and instruct others in the gentle art of sailing. Quite satisfactory, one would argue. Sailing for a whole week at a time and getting paid for leading this idyllic life style. Nothing in this life is free. Including this life style. There is a pound of flesh to be paid in return. And this comes in the form of responsibility. Accountability also, if you wish to play with semantics. Who gets to explain when things go wrong? The skipper. And who is to blame if there is no more food on board? The skipper, of course. When someone gets hurt? Always the skipper. As an aside, keel boats can kill you if you are careless, they are not dinghies that will simply capsize to tell you that you have done something stupid. A heavy burden, if you are not alert. And even skippers get overloaded when they are not careful. My experience of the last week is a case in point. I have the doubtful privilege of losing the Danbuoy, MOB light and life ring. The very safety equipment that is used to assist a person after falling overboard, the Danbuoy being a flag on a floating staff to keep a position indication of the person in the water. It happened in broad daylight in a sheltered bay. So, how come the equipment was lost? The answer is “very easy,” actually. We were doing some MOB (Man OverBoard) drills in Hout Bay, our neighbouring harbour. A sheltered bay on the Cape Peninsula. Also notorious for heavy winds. At the time of the exercise the wind was blowing 10 knots, gusting 15 in glorious sunshine. We were happily doing the MOB exercises, the day skipper students taking turns at the helm. Then the wind picked up and went from 10 knots gusting 15 to blowing 20 knots gusting 25 within ten minutes. I ordered two reefs in the main. While we were reefing the main, the wind went from 20 knots gusting 25 to 27 knots gusting 35 and picking up. We were in the process of reefing, so I ordered the mainsail to be stowed. The jib had unravelled itself while still being furled, with a piece of sail flapping in the wind on either side of the sheets wrapped around the middle on the furler. After all that was secured, we set out to retrieve our equipment still floating in the water. However, by this time, which was under ten minutes time span, we had lost sight of the danbuoy. The water had turned to a frothy half a metre chop by then, obscuring everything that was floating lower than half a metre out of the water. We set out on a rectangular search pattern, but gave up after an hour, the equipment lost. We made an official report to the Maritime Safety authorities and the NSRI (National Sea Rescue Institute) after docking safely back in Hout Bay harbour. This to ensure that they do not launch a search and rescue mission in the event that somebody else retrieves the equipment. Heavy liability there, if you forget and there is a fruitless expense on the side of the autorities. The authorities treat this in the same vein as a bomb scare. So we were covered there, at least. All crew safe and sound, the boat back in harbour, tied alongside safely. Search parties sent out to check on the shore and harbour wall returned with empty hands. We then performed a lessons learned debriefing on board. We were basically prevented from all sailing until we could obtain another set of equipment. Safety first and foremost. Having had this experience, I then asked myself what could have been done differently to prevent this. And I did some very deep soul searching. In the end, the answer is very easy: It was the skipper's fault. Mine. So, why did I not get this one right? A very easy management problem to solve, viewed from an armchair. Don't overload yourself as the skipper. There is a crew. Use them. Delegate. And make very sure you understand the vagaries of your local waters, even if you think it is OK, it's your own back yard and you understand the weather. I did not, with results to show. And above all, remember that a person in the water will not be visible at fifty meters away from the boat in a half meter choppy sea with foam. Even in broad daylight. A scary enough thought to give me nightmares.